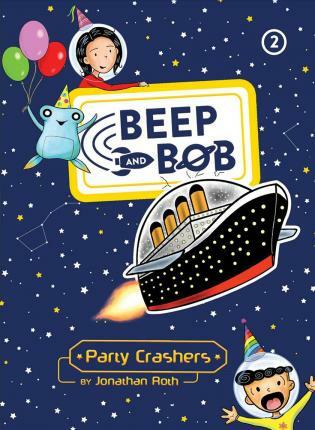 Beep and his best friend Bob get blamed for a robbery on a fancy spaceship in this second book in the hilarious, action-packed Beep and Bob series! It's Bob's friend Lani's birthday, and she's having her party on a super luxury space cruiser called the Starship Titanic, whose motto is "The 100% safest ship in the galaxy." The Titanic boasts three water parks, sixteen amusement parks, and twelve-million hyper-show channels on TV! Beep and Bob pack their favorite swimsuits and their favorite TV watching gear. When Beep and Bob arrive on the ship, however, they realize they forgot the most important item: a birthday gift for Lani. Not only that, but Lani's parents are super rich and expect everyone to wear a suit to dinner (not the bathing suit that Bob wore by mistake). But that's not their biggest problem. No, that happens when the lights dim and guests' jewelry is stolen from right under their noses--and Beep and Bob get blamed for the crime! Things go from bad to worse when Beep and Bob discover that their "indestuctable" ship is headed right for the ice rings of Neptune--and then starts plummeting toward the planet below! Can Beep and his squishy alien buddy save the Starship Titanic? Or will this be their last party ever?